" Please listen carefully and try to hear what I am not saying. " When Riki told me she was using fuschia and lime green for her wedding colors I couldn't wait to work with her! She wanted her wedding to reflect her spunky personality and we were excited to take the challenge. 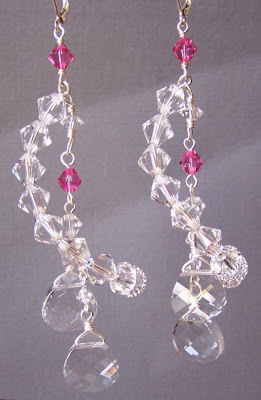 She loves to wear big and bold jewelry, so creating her earrings was especially fun. She was absolutely fabulous to work with and we came up with designs she felt were "amazing". Riki's bold earrings were the perfect accent to her beautiful dress! Swarovski crystal and sterling silver with lots of length and lots of sparkle! The edgy swirl and shimmering crystals echo the elements of her dress. She wanted to spice them a up a little too with some pink crystals sprinkled in. Fuschia for the bridesmaids is definitely a sassy stunning hue! 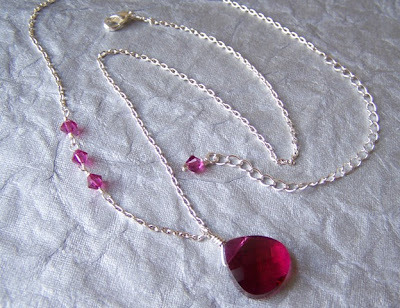 Fuschia Swarovski crystals with sterling silver add a pop of perfect color to the bridesmaid's ensemble. 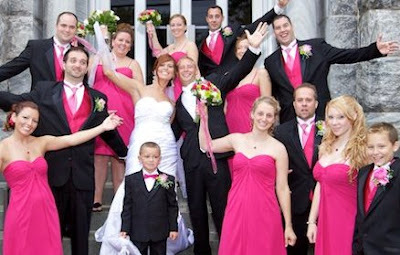 We were so happy to adorn her and her wedding party for a perfect day! The excellent wedding photography was done by Edges Photography. Click here for more samples of our custom design work, and here to contact us for more information. We'd love to work with you on your perfect custom wedding jewelry!